From office space to business centres, workplace environment is undergoing a rapid transformation with GenX and millennials demanding more creative collaborative space. This has led to emergence of co-working or flexible office concept across major cities in the country. Although the concept has seen maturity in the developed economies, of late, India has emerged as one of the world’s most-preferred investment markets, thanks to its thriving economy, burgeoning start-up ecosystem, and ever-deepening talent pool. With businesses big and small continuing to grow and broaden their horizons, expensive real estate coupled with new-age professional’s desire to work in an aesthetically appealing environment have spurred demand for collaborative workspaces in India. In fact, the new millennial workforce will accelerate this changing office dynamics further in the years to come. As per statistics, millennials are set to form 50% of the global workforce by 2020 – and India is the youngest start-up nation in the world, with a rapidly-increasing millennial workforce, says Anarock research. According to Anarock founder and chairman Anuj Puri, co-working centres help startups to save money in office rentals, property maintenance and fixed capital investments. “India, especially Bengaluru, is known for co-working as there are more than 200 co-working brands that are operating 420 such workspaces, both branded and non-branded. This number is likely to increase two to three-fold over the next two years,” says Puri. It is estimated that 250 co-working brands are operational in the country. They have occupied a combined 15 million sq feet of flexible office space stock in India. The growth of flexible spaces has been 50% from 10 million sq feet in 2017 to 15 million sq feet in Q3 2018, according to CBRE India’s Flexible Space Tenant Survey 2018-19. For GenX and millennials, offices are no longer places to sit, churn and dawdle – they are environments where they seek to enhance their creativity, network and thus increase the profitability of their companies. Besides swishy workspaces, tech-savvy millennials also prefer their workstations to be completely technologically equipped - offering hyper-connectivity solutions and modern infrastructure. Co-working spaces are offering just that. Furthermore, these spaces are proving to be the best alternative for a rising number of freelancers, women employees seeking flexibility, and for those looking to be stationed at prime locales with connectivity and faster commute options, Puri said. On their part, companies aspiring to innovate and tap into this new generation of talent cannot ignore co-working. All types and sizes of firms are now embracing the new reality of employees’ expectations for a technology-enabled style of working. Accordingly, they are ready to alter their workplace strategies. Moreover, co-working is proving to be cost-efficient by nearly 15-25% by cutting down rental costs, fixed-capital investments and property maintenance. “Co-working offers flexibility and help reduce time to set up an office. They are ready-to-use office spaces that help companies save on time and cost,” says Nirupa Shankar, Executive Director, Brigade Enterprises. Brigade is the latest entrant in the co-working office business. The company, last week, launched its co-working brand BuzzWorks. Some of the top brands in flexible office space industry are CoWrks, WeWork, Awfis, Regus and Smartworks. The advantage of co-working space is that it helps startups to cut down rental costs, fixed-capital investments and property maintenance when they look at space in the central business districts (CBD) of cities, he says. Anarock estimates the total space occupied by co-working spaces is likely to witness at least 30% to 40% annual increase. Cities that will offer the best opportunities for this trend include Bengaluru, NCR and Mumbai, followed by Hyderabad and Chennai. Nasscom estimates show that India will have more than 10,500 start-ups by the end of 2020 and will remain third only to the US and UK. This will continue for some time and two third of startup founders are less than 35 years. These youngsters are looking at new energising locations. WeWork South India General Manager Yaron Shoshan said the collaborative, inspiring and like-minded community at WeWork attracts small companies looking to grow as well as large enterprises looking to innovate as WeWork is a solution that bends and flexes to a company’s needs, regardless of size or infrastructure. “Shifting away from conventional norms of a space provider, WeWork is accelerating the future of work, and currently has 21 locations across Bengaluru, Mumbai, and NCR - Gurugram, with over 20,000 members in India alone,” said Shoshan. Keeping up with the ever-evolving nature of work, co-working companies offer their members flexible plans – from hot desks for individuals to dedicated desk for smaller groups to private offices allow an individual or a large company to take up space that meets their needs. “The cost of taking up space in Bengaluru may range between Rs 6,000 to Rs 26,999, and this comes with numerous benefits for the members,” Shoshan said. 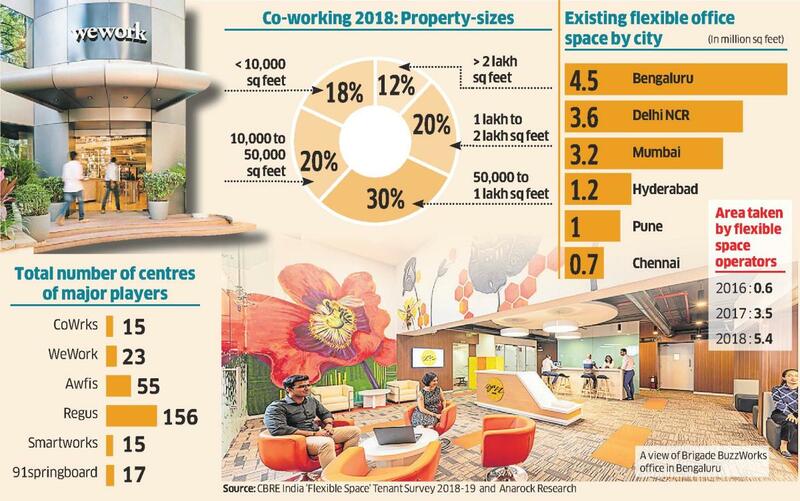 Co-working giant WeWork operates in key localities across cities, including 1.2 lakh sq feet space at Domlur in Bengaluru, 1.9 lakh sq feet space at BKC and 2 lakh sq feet at Andheri in Mumbai, 2.25 lakh sq feet at Cyber City in Gurgaon etc. As for property sizes, nearly 30% of the acquisition of co-working spaces in 2018 happened in the sizes of 50,000 sq feet to 1 lakh sq feet, followed by 20% each of those sized between 10,000-50,000 sq feet and 1 lakh sq feet to 2 lakh sq feet area. BHIVE Workspace CEO and Founder Shesh Paplikar said co-working space as an industry is seeing huge growth as larger companies are also moving into this model due to obvious cost savings and agility it brings to their business. “BuzzWorks will launch over 2,500 seats across 7 locations and 3 cities in the coming months. Our geographical locations will include Bengaluru, Kochi and GIFT city to begin with. We plan to expand operations in other cities with time,” Nirupa Shankar said. Over the next three years, Brigade is looking at adding 1 million sq feet under its co-working office space brand BuzzWorks. Consolidation of co-working spaces started in 2018 with major acquisitions are One Co.Work acquiring IShareSpace and AltF CoWorking acquiring Noida-based Daftar India. In 2018, maximum co-working deals were driven by large PE players and venture capitalists (while in 2017 most of the deals were driven by angel investors and only a few PE players). Besides being flexible and cost-effective, co-working workspace brings to the fore the cultural shift happening in corporate companies. As companies prefer small teams on specific projects to work in a collaborative culture, we can expect co-working spaces fit in for setting up a satellite office at a cost-effective way. Despite all the teething issues that co-working spaces face, these ‘cool’ offices will be the global new normal. However, co-working spaces will also need to invent, innovate and re-strategise their business models in order to create win-win situations for all.